Konami Anniversary Collection Series Announced to Celebrate 50 Years | Nerd Much? Konami is celebrating 50 years in video games, and to bring fans in on the festivities, the publisher has announced the Konami Anniversary Collection series. The Konami Anniversary Collection series will feature a trio of digital bundles. There will be an 8 game Castlevania Anniversary Collection, an 8 game Contra Anniversary Collection, and an 8 game Arcade Classics collection. The Arcade Classics bundle is the only member of the Konami Anniversary Collection with a release date to this point. It’s digital only and listed at $19.99. Games will include Haunted Castle, Typhoon (A-Jax), Nemesis (Gradius), Vulcan Venture (Gradius 2), Life Force (Salamander), Thunder Cross, Scramble and Twin Bee. There’s no release date on the Castlevania Anniversary Collection yet, Konami has only listed it for early summer. The game list also isn’t complete. Announced for the bundle are Castlevania, Castlevania 2: Belmont’s Revenge, Castlevania 3: Dracula’s Curse and Super Castlevania 4. But the remaining four games remain a mystery. We haven’t really seen the fantastic trio of titles that hit the Gameboy Advance really show up in many other forms, so there’s a shot some of these are included. However, you would imagine that Castlevania: Symphony of the Night and perhaps even Castlevania: Rondo of Blood are must haves in the package. Even if another bundle featuring the two was recently released. As for the Contra Anniversary Collection, games included thus far are Contra, Super Contra, Super C, and Contra 3: The Alien Wars. Just as with the Castlevania Anniversary Collection, four more games are being added, with a release date slated for early summer. Each of the anniversary collections will also come with a digital artbook. 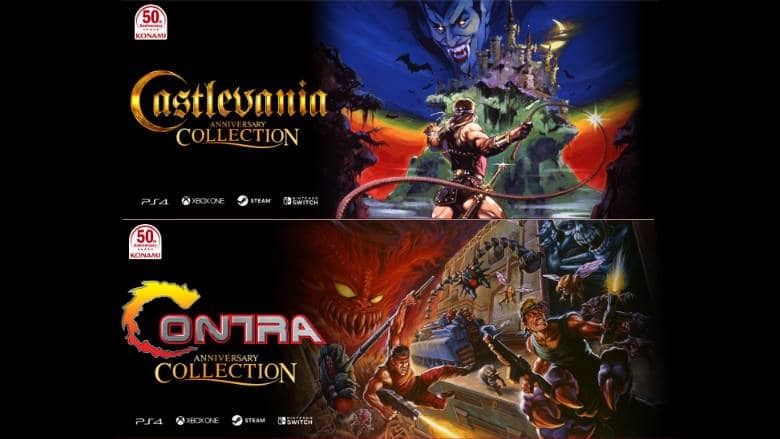 There’s no description for the Castlevania and Contra ones, but the Arcade Classics reads that it will be “a bonus eBook packed with new information about the titles, including interviews with the development staff, behind-the-scenes insights, and sketches and design documents never before revealed to the public”. All three of the bundles are set to arrive on PlayStation 4, Xbox One, Steam and Nintendo Switch.